West Hampstead Life | What have I missed since August 25th? What have I missed since August 25th? Starting this Monday there’s going to be a street food market every weeknight from 4-8pm by the Thameslink station. The aim is to catch the commuter crowd on their way home. And… a butcher is coming to West Hampstead. The owner is staying tight-lipped about details and West Hampstead Life has been sworn to secrecy, but it is happening. 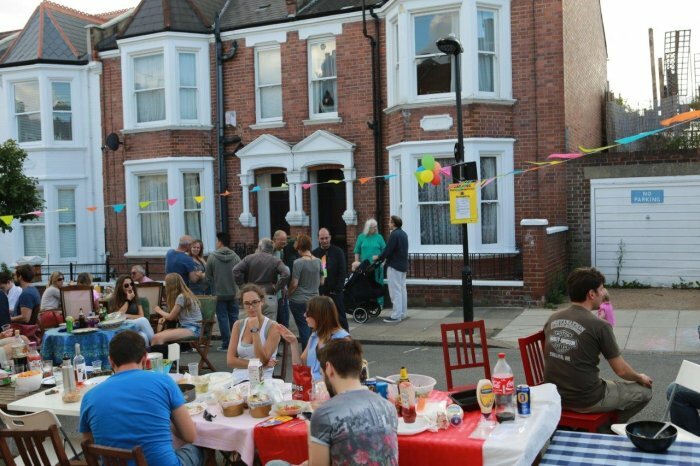 Residents of Narcissus Road held a street party to celebrate the street’s 125th anniversary. Brooksby Wines, West End Lane’s independent wine shop, is up for sale as a going concern. A local councillor is raising the question of whether Billy Fury Way should be closed. Have your say. What did Tom make of his visit to Bombay Nights? Surely it couldn’t live up to the Tiffin Tin? Sadly the Film on Fortune Green had to be postponed from this Saturday to next – September 6th. In the meantime, the rest of this week’s cinema listings are here. The late Doris Lessing’s extensive collection of books is to leave West Hamsptead for the southern hemisphere. Barclays is closing its tiny Kilburn High Road branch. The final draft plan of the Neighbourhood Development Plan will be published Monday. In the never-ending war against the fly-tippers, the local environmental officers are to get warrant cards to help them punish any perpertrators. Sunday’s African Edutainment Festival in Kilburn Grange Park got a lot of locals’ backs up due to excessive noise levels. There seems to have been a spate of nails left in roads, and then going into people’s car tyres of late. Not clear whether it’s a result of a lot of careless builders or is deliberate. Degree of Arc at the Good Ship on Saturday is our Gig of the Week. All the upcoming music listings are here (including a flautist at JW3 and a Hammond organist at La Brocca). Advance warning that the NLT is closing for a 3-week refurb from the 7th-26th September. One Sixty’s opening its doors this Monday evening to show off its new internal artwork (and Camden Brewery is providing beer – all welcome). The Kilburn High Road's like the Forth Bridge. They dig it up from end to end. Pause. Then come back and dig it up again. For fun.